There are many ways to work with the UFT testing tool and Business Process Testing. This example demonstrates the ease with which Automating Engineers can access Business Process Testing functionality from directly within UFT, the tool with which they are most familiar. This example demonstrates the collaboration between Automating Engineers working primarily in UFT and subject matter experts working in Business Process Testing. 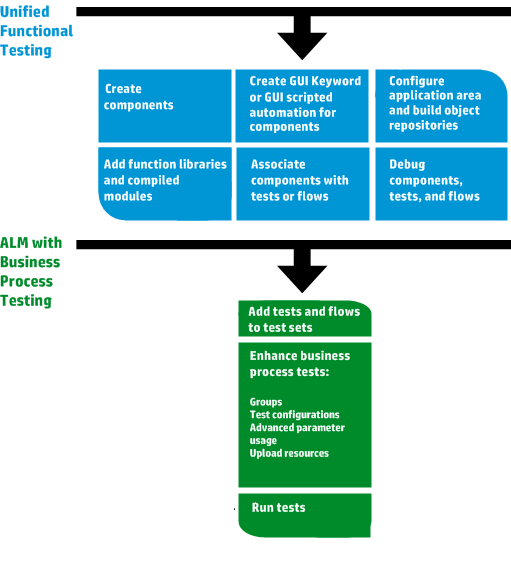 The following is an example of a common Business Process Testing workflow using Unified Functional Testing (UFT). This example demonstrates one possible method for working with components and keyword GUI steps. Note: The actual workflow in an organization may differ for different projects, or at different stages of the product development life cycle.